The recent calls to ‘Save Union Terrace Car Park’ ring a little hollow for the people who wanted to save Union Terrace when it was a street of family homes. These smaller voices – expressed in letters to the local paper (see links below) – have perhaps been lost in the tumult. In the 1970s a new ‘improved’ inner ring road was planned, and areas were cleared in preparation for it, including at the bottom of Marygate, and here at Union Terrace (see note, bottom of page). As a result of the Clearance Area orders and Compulsory Purchase Orders many homeowners had to clear off, and find homes elsewhere. The local authority served notice that they were going to buy certain properties, they then assessed how much each one was worth, paid the owners, then demolished whole streets. Or in this case, nearly the whole street. Forty years on we’re struggling to find enough land to build housing on, and the housing we’re building is often of poor quality. Judging by the bit of the street of Union Terrace which wasn’t demolished, next to the coach park, the houses here were substantial and handsome. But they were smashed to bits because in the 60s/70s that seemed the right thing to do. Forty years on people still write to the local paper about the impact of the council’s decision, or their grandchildren write on their behalf. The sense of injustice and upset remains, after all these decades. Having created a car park in the area cleared for a ring road, the more recent plan is to sell it to the nearby university, to be built on again. This is clearly another bonkers idea. 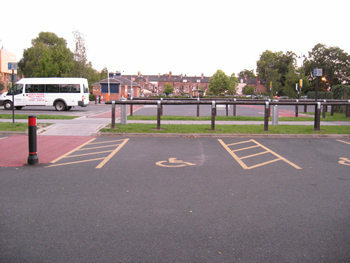 Many local businesses and organisations depend on the car and coach park, which brings visitors to this side of the city. Judging by past history whatever is built here they’ll probably want to demolish again a few decades on, having caused havoc in the meantime to all those affected. After this area was knocked about by demolition, the locals adapted to the situation, making the best of it, as residents who care about a place always do. Gillygate has just built itself up again after the ‘blight’ caused by the ring road plans. It took decades. The combination of many individual efforts by ordinary people eventually gives a place back its soul, makes it thrive. Then councils come in with mad schemes, hack it all about, and undo all the progress. The 1852 plan of York shows the old street of Union Terrace (then quite new) in some detail, with individual houses marked. The plan opens centred on the Minster. Pan northwards/up and west/left a bit and you’ll see Union Terrace and Clarence Street as they were then. The lost homes of Union Terrace are a reminder of past mistakes, made by people who at the time thought that they were doing the right thing. Councillors, your predecessors caused enough destruction around here, and the community adapted to having a car park instead of a street. Might be best now to leave it as a car park? The ArcLight centre relocated to Union Terrace some years ago, using part of the car park area. 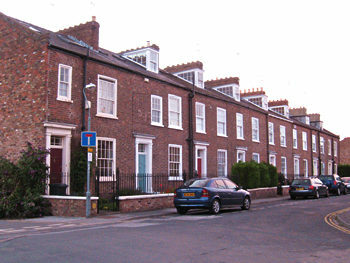 The relocation plans in 2006 provoked a letter to the local press which first drew my attention to the hurt felt by many who used to live in this street: ‘even after 35 years the sense of injustice still rankles’. If you lived in Union Terrace or were active in protests against the demolition of this street, I’d like to hear from you – please add a comment. Since this page was compiled, the plans to sell part of the Union Terrace car and coach park have been abandoned. Not because the City of York Council saw sense, but because St John’s did, and withdrew their offer. See the BBC website – Union Terrace coach park: University withdraws offer – for more. See also: a 19th century resident of this street and my search for his door …. I was one of the people who bought back the surviving Union Terrace houses from the health authority in the early 1990s and restored them. I have an album of photos from the renovation. I lived at no 81. I would love to see those Gavin: they are a very important part of the history of the street. Have you thought about publishing them: either on a blog (sorry Lisa, I’m not trying to increase your workload – honest! ); or via a photo site? I’d be interested to see them too. But if they’re in albums that’s not as easy as passing on digital images, so would mean some work for Gavin, and then I’m working my way through a bit of a backlog of ‘to do’ things. But can be contacted via http://yorkstories.co.uk/contact/ for an email address to send photos to, and will follow up with Gavin if I can. I lived at 26 Union Terrace mid to late 70’s. I lived at no 57 union terrace. Went to park grove school. My mum was Betty Sutcliffe and mr dad was Roy Sutcliffe.